Root Change, in partnership with Keystone Accountability and Youth and Society (YAS),has been working with key actors in Rumphi and Mulanje districts in Malawi to test Social Labs as an alternative to the traditional project approach of foreign aid, which has left many communities feeling powerless and distrustful of NGOs, local government and international agencies. The frustration felt by communities in Malawi is not unique to the country. There is a growing realization among many on the receiving end of aid, as well as practitioners, that the current project model within international development is not sufficient in addressing complex social problems; at its worst, the delivery of aid through the project model disempowers local actors from leading their own development. Many in the field have used the term “projectization” to express these concerns, other practices like short time frames, logframes, results agendas, staff rotation, the growing business of aid and self-preservation of INGOs, have been pointed to as similar examples of a broken foreign assistance system. Root Change and partners have turned to Social Labs as an alternative model aimed to #shiftthepower. The Social Lab currently being tested in Malawi is supported under an action research grant from USAID Local Works. Local Works is a unique program that is funding country missions and global researchers to learn how USAID can better support local actors to take the lead in addressing development challenges (and ultimately become less aid-dependent). The idea for the Social Lab came from a listening tour Root Change and Keystone Accountability conducted from April to July 2017 in Malawi. Root Change met with over 120 diverse actors across the country, many of whom had been nominated because of their deep understanding of the challenges of the aid system in Malawi. Participants described how development projects usually begin with high hopes and expectations, but over time become mired in mistrust and dependence. An alarming number of people expressed a belief that development projects are simply a way to justify the providers’ existence. Some of the Malawians we spoke with said that “development” feels like an external imposition. Even so, very few were ready to forgo international assistance. In this regard, our conversations were very similar to those documented by the Learning Agenda on Capacity Development and CDA Collaborative’s five-year listening project. Malawians cite specific examples of good work, however after an expression of appreciation, there is almost always a “but”. At its worst, we heard that aid creates alienation, subjugation, and learned helplessness. Extractive measurement practices that prevent communities from benefiting from data they produce. We look to Social Labs as a potential alternative model that could convene actors at multiple levels within the development value chain to focus on these systemic traps. To frame the problems and set the goal of the Social Lab we drafted a Bill of Rights and Responsibilities, which was then validated by local Malawian stakeholders. It describes the rights and responsibilities of citizens, local CBOs/NGOs, international agencies and donors, and presents a new set of goals to address the four development traps. The objective of the Social Labs would be to test out how to best uphold these rights, repair trust and relationships between system actors, and explore news ways of working that would produce development outcomes. 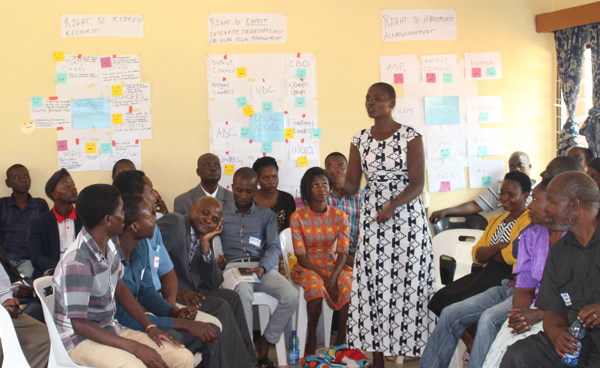 We selected two districts in Malawi to test out the Social Lab model, Rumphi in the North and Mulanje in the South. In Rumphi we partnered with Youth and Society (YAS), an emerging civil society leader working on citizen voice, human rights, and governance at a national level, and in the south hired two Field Managers with deep connections to grassroots community development (Myson Jambo and Emas Potolani) to support with leading the Social Labs. Social Labs were initiated after a week long design workshop. Extensive outreach was conducted before hand to identify and nominate changemakers in the district. A diverse, multi-stakeholder group of 70-80 participants were convened in both districts. By the end of the five days, participants had voted on their top 5-6 ideas and formed teams around their passion projects. Teams designed short “lean experiments” they could test to validate a core assumption that must be true for their big idea to succeed. Read more about each day of the design workshop on Keystone Accountability’s blog here. Innovation through “lean experimentation” was perfected in the tech sector. Business start-ups learned they could test an idea to improve their products or services without risking excessive time or resources. Experimenting in the same way with ideas from the Malawi Social Lab will allow teams to “fail small” and learn from the process before scaling up. We have been working in Malawi since March 2017, and will be testing the Social Labs though 2019. We will be writing a series of blog posts to delve deeper into the learning that emerges from the Malawi Social Labs. Our hope is that this kind of collaboration can help to level the playing field, turn over control and decision making to local actors, give those in the development system an opportunity to work together in new ways on systemic challenges that affect everyone.